Who doesn’t like being the office hero? You swoop in with a game-changing idea that lands the big client, helps cut cost, or boosts morale and productivity. Market research revealed exactly that about potential managedIP customers in Minnesota and Michigan—they love being the office hero. That intelligence¬¬ became the catalyst for TDS’ “Office Hero” direct mail campaign in the Twin Cities and Grand Rapids, says Stephanie Senner, TDS Telecom manager of Commercial Marketing. It’s expensive to advertise using traditional media in those markets, so the Creative Services, Digital Operations, and Commercial Marketing teams created a direct mail campaign. “These days there is so much direct mail advertising. We needed something that would stick out,” says Stephanie. Instead of doing a regular mailer, the team decided to do something different––send out super hero masks! With the creative work complete, the team was left with the very difficult task of finding a team to physically assemble all of the direct mail pieces. About 4,000 masks needed to be stuffed into plastic bags, labeled, and mailed in about 30 days. In other words the team was in need of an office hero or two. As luck would have it, Stephanie attended a luncheon for an organization called Abilitree. 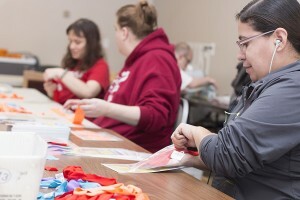 The central Oregon non-profit provides employment, resource referrals, social security advocacy, and support groups to adults with disabilities. One of the services offered to the business community by Abilitree is mail fulfilment. Stephanie says the partnership was a win-win. TDS got the work it needed done, in a timely fashion, and for a reasonable price. It also gave the company the chance to act on one of its core values.